SAP introduced S/4 in 2015, termed as Simplified 4th generation ERP Business Suite. This is a major milestone in SAP’s ERP product evolution from R/2, R/3, ECC to S/4. SAP reimagined all the processes with simplification and digitalization at the core and usage of the latest innovations in speed of data processing, such as in-memory database – HANA, machine learning, and web based & user-friendly GUI, such as Fiori. Two software versions are the going forward strategy for SAP – S/4 Cloud version with a quarterly release cycle and S/4 on-premise version with a yearly upgrade cycle. Companies with SAP as their ERP backbone for business are at a stage of looking into how to approach an S/4 upgrade or S/4 implementation. This document outlines a strategy and approach for their S/4 Roadmap. Comprehensive Business Case preparation is required for justifying the investment for an S/4 upgrade. Current in-flight projects, their importance, and relevance for Organizational Strategy would have influence on the priority of an S/4 upgrade / implementation project. A true value assessment with process and technical elements would provide a plan for capital budgeting for the organizational initiative. Once the justification is established, the next logical questions are “when” and “how”. Ownership: Business Leadership or IT Leadership are the key decision makers who impact the overall strategy. While IT leadership has insight into technological advances, business leadership is the true justifier of the investment. Business Environment for Changes: Some organizations are early adopters of new innovations and others wait for the new offerings to mature. Early adoption induces some risks along with quick benefits. Examples: Companies who implemented Simple Finance early on had to undergo one more round of upgrade to S/4. Three versions of S/4 – 1511, 1610, and 1709. Business risk can be avoided if timing is correctly determined. Time – How long of a wait to upgrade? Systems are constantly changing. There is no perfect period for an upgrade as new versions evolve with time. The easiest upgrade is to go from the previous person to the next. If organizations wait too long, support costs escalate and future upgrade costs increase as well. Greenfield Implementation. This is the new implementation of S/4HANA into which data from a legacy ERP system is migrated. This is natural choice for new SAP customers. Some of the existing Customers also adopt this approach to bury the shortcomings of their existing customization and adopt new innovations. This can be called as “Clean Implementation”. Brownfield Implementation. This option is available for on-premise versions 1511 onwards and transition of existing – ECC, Business Suite on HANA, Simple Finance to S/4. Whether this is cost effective or not depends on the current systems’ custom code and integration with 3rd party systems and solutions. Landscape Transformation. Companies with large scale user base with different regions, multiple source systems must go with different approach. These organizations may opt for consolidating all systems into single S/4HANA instance and go with transition to S/4 plans and may also adopt some mixed approach of greenfield and brownfield, as suitable for their source systems. Most organizations are confident about their understanding of their current system landscape. In reality, business systems, integrations and processes evolve over a period and they remain more complex than they are visible. Different versions of software, heavy customization, organizational silos add complexity to current evaluation your current business system landscape. A systematic assessment your current business systems and their process inventory would help the true estimation of an S/4 project cost while also minimizing the business risk of disruption of technologies. Cloud applications – such as Concur, Coupa, Salesforce and Workday – have become common and standard cloud solutions. While undertaking a major project towards SAP S/4, it is important to investigate your business process portfolio and make an appropriate assessment whether to switch any applications from traditional ERP to cloud based solutions. As a common example, companies using SAP HR modules in ECC are now considering either going for SAP’s cloud-based tool, SuccessFactors, or Workday. Since there are significant benefits for cloud applications and less maintenance, this decision has greater impact on overall strategy. Upgrading to S/4 is a significant investment in terms of resources, time, and cost for organizations. Performing a Business Value Assessment would provide insight into technological changes and impacts on business process changes. Looking into current landscape of business systems, their level of software versions and integrations is a prerequisite for successful adoption of S/4. SAP provides a simplification list in S/4 and provides details on how different elements changed. Simplifications are categorized into the following based on the type of impact they have. Analyzing the simplification provides inputs into the overall roadmap and strategy on whether to go for a greenfield or brownfield implementation. Re-architecting SAP HANA in-memory platform: Applications are now optimized with new capabilities of SAP HANA as SAP HANA provides new database structures. Example: Single Universal Journal table is provided for accounting, which eliminates data storage in multiple tables and reduces the financial closing cycles. Embedded Planning functions are some of the new business functions. Consolidation of existing functionalities: Underlying technical details changed, but, from an end-user perspective, the functionality remains the same. Example: Order-to-Cash functionality remains the same though the underlying tables for material documents have changed. No functional equivalent: There are some business processes eliminated from ECC. SAP provides alternative options, such as providing cloud solutions. Simplifications Analysis provides a view whether the organization is ready for an S/4 migration or not. If some processes used extensively in your current system is not available in S/4, it may not be the right time to upgrade unless alternative options are evaluated. For a conversion to be successful, the source system, custom code, and target system (simplifications) must be analyzed. During your analysis, you may come to realize that your custom code must be remediated. SAP suggests multiple iterations of testing until the system is ready for production. SAP provides various resources regarding this. Simplification List: A PDF document and also available as a web-based tool. SAP Readiness Check for SAP HANA is a new cloud-based tool provided by SAP to perform Simplification item checks, custom code, recommended Fiori apps, and other compatibility comparisons/checks. SAP provides an ABAP report, which is an available check to be performed on systems 1709 and onwards. System readiness check for HANA (cloud-based tool) provides a graphical view of different elements of custom code and other components. Custom Code has to be adopted after conducting checks against Simplification Database and remediate whether a specific custom code is needed. If functionality is changed, it needs to be evaluated from a functional process perspective whether this code is required to be adopted or dropped completely. SAP S/4HANA simplifies many of the technical data models discussed above and best utilizes the in-memory database, which contribute to speed and design thinking. As the technology landscape continue to change with cloud, big data, machine learning, robotic process automation (RPA), and process bots, business processes need an ERP system to support these technological advances. SAP S/4HANA provides these desired technological environments for businesses to adopt. Embedded Analytics – A major technical hurdle for businesses in earlier ERP systems was time lag between transactional data and analytical data. SAP S/4 provides built-in tools for embedded analytics, eliminating the need for data replication as the reporting comes out with real-time data. Reconciled Data – SAP S/4 provides unified data structures and a single table data storage for Finance. There is no need for reconciliation effort. This eliminates the historical issues, such as reconciliation between General Ledger and other reporting ledgers. Role-Based Fiori – Award winning SAP S/4 Fiori is the standard GUI for all SAP products, including SAP Support Portal. This standardization brings the user interface to the next level and is the most business-friendly & natural way to interact with business systems. Intelligent Fiori Apps – Fiori apps, when associated with KPIs, would automatically get updates and visually display key figures on its tiles. For example, Revenue figures can be seen on the dashboard without having to drill down to the application. 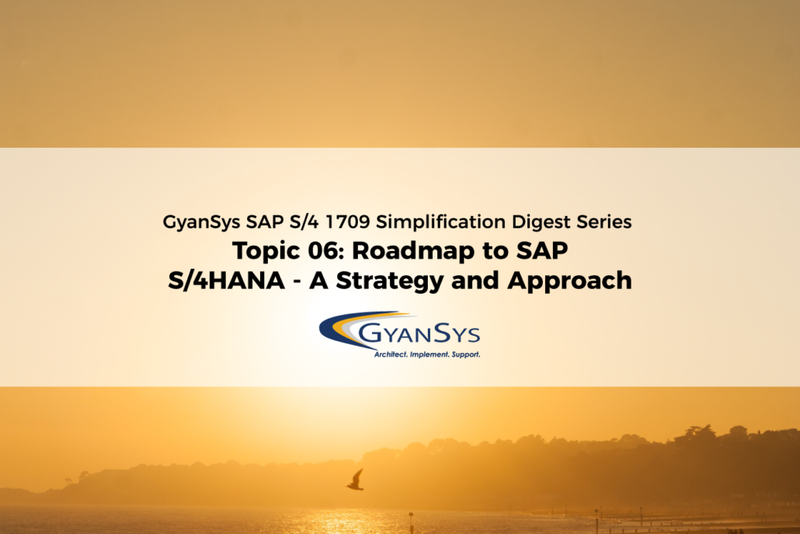 This blog post is part of GyanSys Solutions Lab’s weekly series titled SAP S/4 1709 Simplification Digest. Come back every Friday for a new post or you can subscribe below to get updated every time a new post is published! Contact us to learn more about changes in SAP S/4 1709 and how it impacts your organization. GyanSys Solutions Lab focuses on researching trends and updates in all of the upcoming releases of the S/4HANA.